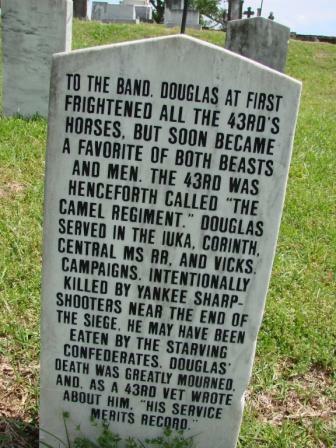 Douglas's markers in the cemetery, located with the men of the 43 Miss. Inf. Douglas was their mascot and carried much of their equipment. Coins left on Douglas's marker. Another view of coins on Douglas's marker. Note in the lower right hand corner, in the grass, the gift of a tiny dinosaur, blown off the top of the marker by the wind. What Do Coins On A Marker Mean? 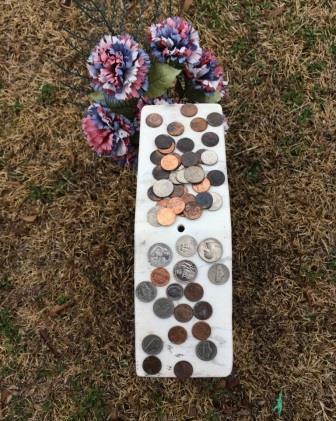 A coin left on a headstone lets the deceased soldier's family know that somebody stopped by to pay their respects. Leaving a penny means you visited. A nickel means that you and the deceased soldier trained at boot camp together. A dime means that you served with the soldier. A quarter is very significant because it means that you were there when that soldier died. 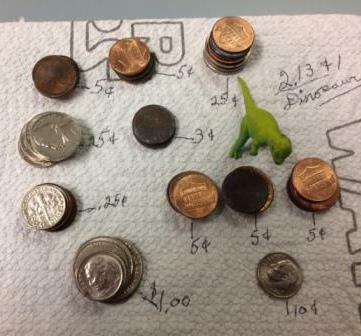 The coins from the marker of Douglas the Camel add up to $2.13 and One Dinosaur, undoubtedly from a child's pocket. "Teach your children who these dead men were. Tell them of their lofty courage. Instruct them in their virtues." 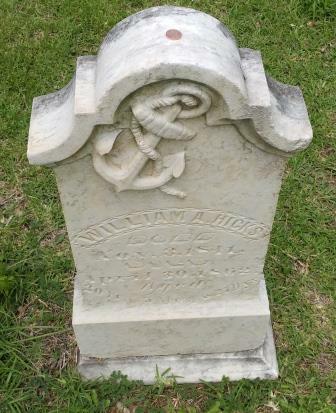 The marker of William A. Hicks, Confederate States Navy, with a visitor's coin on top. Today, visitors leave coins out of respect and with special thoughts of the soldier's sacrifice. 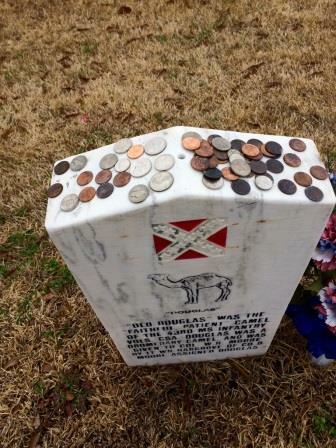 Traditionally, coins left on a marker (or on Douglas the Camel's marker) go to the upkeep of that grave. Why is Douglas the Camel Here? Douglas carried equipment for the 43th Miss. Volunteer Inf. Regt. and gave them their name of the Camel Regiment. He served proudly in the Iuka, Corinth, Central Mississippi Railroad, and Vicksburg Campaigns. Camels were brought from the Middle East in the 1840s to form a cavalry mount for the U.S. Army in the American southwest. Camels helped greatly with transportation and expansion into the new and often hostile territories. They could reach speeds of up to 40 mph, travel days without water, carry heavier loads than mules, and, in the end, push wagon trails westward to expand the nation. The last of these camels died in 1934, but their descendants are still roaming the southwest. 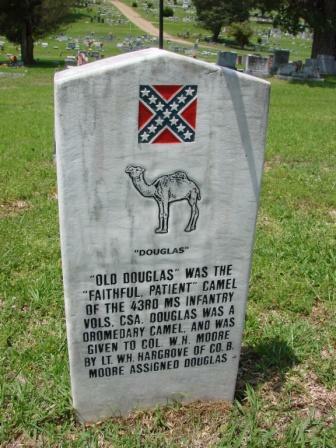 The use of camels in the country's westward expansion and now during the war to aid militarily was being tested and Douglas was only one of hundreds. The descendants of these camels are still roaming the West. 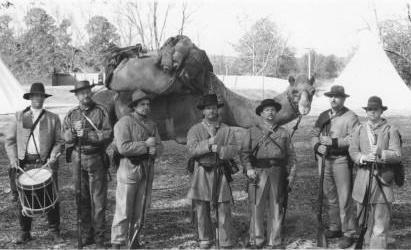 Forrest Bryant Johnson has written about the history of this project and the people -- including foreign camel handlers -- who worked to make it successful in his book, The Last Camel Charge: The Untold Story of America's Desert Military Experiment.